Direct Supply, Inc. provides chipboard pads, sheets, folding cartons, dividers, and mailer inserts in a variety of weights, coatings, and sizes! Get extra protection for your packaged goods. Contact us today to find a chipboard solution for your business. What is a chipboard sheet? If you’ve heard of kraft packing paper, chipboard is like kraft paper’s sturdy friend. A chipboard sheet, sometimes called a chipboard pad, is usually made of 100% recycled paper, pressed into a dense material that looks like thin cardboard but is not corrugated (there’s no crimped paper structure sandwiched in between slats). Sheets can be bleached to create a white chipboard pads, suitable for custom printing. The word “sheet” comes from the manufacturing practice of cutting rolls of chipboard product into easy-to-use, standard sized sheets. What is a chipboard pad? Chipboard pads are made from the same material as sheets. However, the word “pad” implies that the chipboard is being used as an element to increase the rigidity of an envelope mailing. It can also mean that a piece of chipboard is being used as a pad for added product protection. The pad can be used in between products within a corrugated box container for added protection during shipping, separating two tiers of glass jars in one box, for example. One of the most popular sizes of chipboard sheet is actually the same size as a US standard letter piece of paper – 8.5×11”. 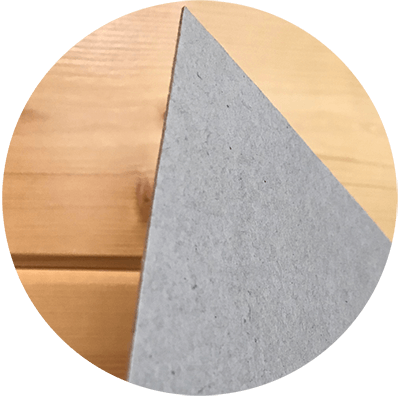 Sheets of chipboard can come in a variety of alternate sizes that are convenient for consumer use, and can be obtained from craft stores. For industrial use, chipboard sheets can come in almost any custom size and folding configuration the customer specifies. Chipboard comes in a range of weights, from 10 pts. to over 100 pts. Weights are sometimes displayed in inches, like .022” to .050”. Lighter-weight material is better suited for display cartons as it’s easier to score, bend, and fold, whereas thicker board is best when rigidity is needed. Chipboard dividers or partitions, in their unfolded state, are used to snugly fill the space within a box in a grid-like pattern that separates individual products in each grid square. For example, think about a six-pack of root beer bottles in a carrying container: Each bottle has it’s own spot in the box. Not only is that box itself made entirely of chipboard, it’s also manufactured with dividers to protect the glass bottles it’s designed to carry! Before being attached to a box, dividers can be folded completely flat and stored until use, making them a great space-saving packaging product. The in-box organization offered by a divider allows companies to fit more items in one box, helping them save money on packaging overhead. Any legal pad of paper you own has a firm backing made of heavy weight chipboard. Most display containers you see in your local grocery store are made of lightweight chipboard, bleached white, and printed to convey the product’s branding and contents. Some examples include boxes of disposable contact lenses, boxes of doughnuts, and boxes of cereal. To get an attractive finish and make a carton’s colors pop, many times brands will use veneered or coated chipboard to give their products an added sheen. The coating also adds a slight level of water-resistance to the box, as light moisture will roll off a coated sheet of chipboard rather than be absorbed by the material. Let Direct Supply help you! We can find the perfect packaging materials to fit your needs. Contact us today to find out how we can help you add some protection to your packaged goods!